I am a fly tyer who specializes in Deer Hair. When I was 4 years old my dad took me fishing in the oxbow lakes that were formed by the Missouri River west of Whiting, Iowa. We fished with a bamboo cane pole, a cork float, and a hook and with worms we dug in the garden. 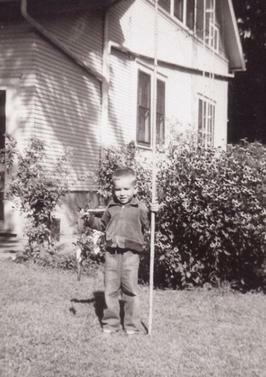 Growing up in rural Iowa as kids we all spent a lot of time fishing in the local creek for Carp and Catfish and Bullheads. We graduated to fishing in the Missouri river for bigger Carp and Catfish and anything else we could catch. We also fished at Blue Lake, which was one of the oxbow lakes off of the Missouri river. It was a long bike ride south of us about 15 miles. There we caught Bass and Northern Pike. I had a few years with very little fishing. In the Air Force I loaded nuclear weapons on the F101 and F106 and conventional weapons on the F105. I was trained on the weapons systems for most of the Air Force aircraft in Southeast Asia. My main duty stations were in Thialand. I am Vietnam Veteran. I went back to school and sought employment as a civilian, got married and started a family. All of which I am very proud, but I did very little fishing during this time. Eventually I got back to fishing for trout at Lake Tanycomo in Missouri. I also got my dad back into fishing by taking him trout fishing on a three day weekend in October 1979. This was the start of two changes in my life. First, we started a fishing tradition that lasted 25 years. We got my brother involved and we did everything we could to make that fishing trip take place. In the family it was commonly referred to as the "Jack Daniel's fishing trip." A book could be written about the trips but that is another topic. The second thing that took place was fly fishing. Dad and I eventually went back to the same oxbow lakes we fished years earlier. Only now I was fulfilling a dream I had as a kid, I was fishing with a fly rod to catch bass. I was using an old rod and reel I purchased at an estate sale. I still have the reel but the rod did not make it. This started me on another aspect of fly fishing, tying my own deer hair bugs. I eventually developed my own techniques for "spinning deer hair." I discovered later that I was actually stacking deer hair. I watched one video on a weekend and that was the extent of my formal fly tying instructions. I would take my flies into K&K Fly Fishers to have them critiqued and always felt good when I left because they told me how great I was doing. I assumed it was a ploy to get me to come back and buy more Mustad 3366 hooks and Deer Hair. At the time I really had no idea that what I was doing was unusual or any different than any other fly tyer. I am a fly tyer who works with Deer Hair. I have tied at various venues including The Bass Pro Shop in Springfield, Missouri, Sow Bug Roundup, Southern Council and International FFF Conclaves, Fly Tying Festival in Houston, Texas, Smallmouth Rendezvous in Tahlequah, Oklahoma, Fly Fishing Show in New Jersey, and the Norwegian Forest Museum in Elverum, Norway. I have assisted in fly tying classes and worked part time for K&K Fly Fishers for several years. I have conducted Advanced Deer Hair seminars for the IFFF at the Southern Council and the International level. My flies are individually auctioned for FFF fundraisers and consistently appear in FFF Fly Plates, some specifically for “Casting for Recovery” and “Healing Waters”. They were used in an ad campaign for The First National Bank of Olathe. They have been in several issues of “Flyfisher” Magazine, featured in the autumn 2003 and mentioned in the autumn 2004 issues of “Fly Tyer” magazine, winner of the “Patent Patterns” Summer 2005 “Fly Fishing and Tying Journal”, and included in volume 1 issue 3 of the “Art of Angling Journal. I am honored to have been chosen the 2004 and 2009 FFF Southern Council Fly Tyer of the year. Other awards include first and second place medals in the FFF fly tying competition in 2006. There are also Gold Medals in the "Open" category of the Mustad Scandinavian Open Fly Tying Competition in 2004, 2005, 2006, 2007, 2009, 2010, 2011, 2012 with Silver in 2008 and 2013. Also a Gold in the "Dry Fly" category in 2011. The MSO is considered the premier fly tying competition in the world. I believe I hold the record for the most Gold Medals in the Open category. In August 2015 I was honored to receive the IFFF Buz Buszek Memorial Award. All of my entries and medals and honors were earned with my Deer Hair work. 13. Far Banks Pro Program. On my Dad's refridgerator when he passed away. "If we concentrated on the really important things in life there would be a shortage of fishing poles."